It was with much excitement that our own gang of five set out for Newcastle-upon-Tyne to review the new Enid Blyton exhibition at Seven Stories. Expectations were high as I devoured Enid Blyton books as a child and my children have also loved the Magic Faraway Tree and the Famous Five series. We had arranged to visit on the warmest weekend of the year so far and whilst it seemed a shame not to enjoy the fleeting sunshine, the lack of crowds at the exhibition was an unexpected treat. How do you do justice to an author who wrote over 700 books in her lifetime and could produce a full-length novel in a week? The exhibition sensibly concentrated on her most popular books, with areas dedicated to The Famous Five, The Secret Seven, the boarding school books, The Enchanted Wood and Toyland. We followed ‘Timmy’s Timeline’, tracing how the Famous Five phenomenon has grown since the publication of the first book in 1942. Whilst my husband and I enjoyed reminiscing about the TV series and annuals we remembered from our childhood, the displays kept the children entertained. They sat in the Secret Seven’s shed (with the requisite picnic goodies in a handy basket) and slid down the Magic Faraway Tree in The Enchanted Wood, before dressing as goblins in a fairyland setting. Noddy’s Toyland attracted them as they used the coloured bricks to create their own Toyland building and dressed as Noddy and Big Ears whilst driving Noddy’s instantly-recognisable car. I was intrigued to read that Enid Blyton’s books were created to take a child from their early years (with the brightly coloured fantasy world of the Noddy adventures), right through their early forays into reading alone (with the simple language of the Secret Seven books), to more sophisticated independent reading with the Famous Five and boarding school books. Surely an interesting example of creating brand loyalty before the term was commonly used? Whilst exploring the exhibition, I was struck by the ‘finishing touches’; paperback copies of Enid Blyton’s most popular titles were available to leaf through in each section, the children were entertained completing various worksheets and drawing themselves as the ‘extra’ member of The Secret Seven and they could sit at a replica of Enid’s desk and write their own comments about her books. An area of Enid’s writing, with which I wasn’t familiar was her nature writing and I found this a charming section of the exhibition. ‘Grass’ covers the floor of the ’Green Hedges’ area and children could play with baskets of toy animals and insects whilst ‘eating’ picnic baskets of goodies. 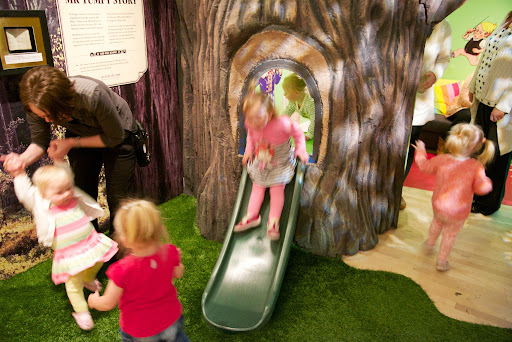 As well as the Enid Blyton exhibition, Seven Stories also boasts a Cressida Cowell ‘How To Train Your Dragon’ exhibition. If you visit the Artist’s Attic on the top floor, there are regular storytelling sessions and a chance to see artwork inspired by Lost and Found author Oliver Jeffers. We rounded off our visit with a visit to the Creation Station, where we designed compasses to guide us on our own Famous Five adventures. We visited the Seven Stories at the start of the holidays and although we had plenty of activities lined up for the rest of the week, my son declared that our visit was ‘definitely the best thing we’re going to do this holiday’. Couldn’t agree more! Many thanks to Seven Stories for inviting us to visit the Enid Blyton exhibition. To visit the Seven Stories website, please click here. 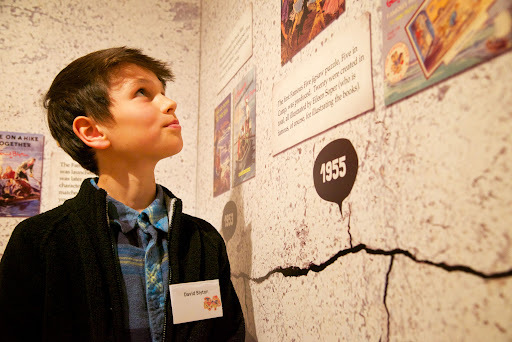 To read more about the Enid Blyton exhibition, click here.